✔ 2000mg per Serving – 2:1:1 Ratio. ✔ Manufactured in the UK Under strict GMO conditions. ✔ Helps to increase protein synthesis. Branched Chain Amino Acids consist of the three amino acids Leucine, Isoleucine and Valine. BCAA’s can’t be produced by the body therefore must be supplied by diet. The Protein Labs BCAA’s have been specially formulated to be metabolised directly into the muscle where they are needed most. 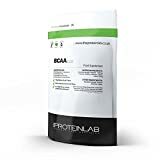 BCAA supplementation, help promote muscle protein synthesis and increase muscle growth over time. It can also be used to prevent fatigue in athletes. BCAAs have been proven in many studies to be a potent performance enhancer. BCAA can have a positive impact on testosterone levels when consumed pre-training. During intense training it is normal for testosterone levels to rise. After training is ceased testosterone levels will begin to fall back to normal baseline levels. Studies have shown that when athletes were given BCAAs prior to training, post-workout testosterone levels remained elevated for several hours, whereas the control groups noticed a significant drop in testosterone once training ceased. This can go a long way to maximizing growth from every single training session. BCAAs make a great energy source for working muscles because of their unique metabolism. This can have a positive impact on performance. Not only can BCAAs be used as energy themselves but they also enhance fat oxidation in glycogen depleted subjects. This allows individuals to train harder for longer without fatigue due to the higher energy demands being met. BCAA are important to ingest on a daily basis.